Wednesday 23rd January 2019 saw Northern unveil a train named in honour of the Bentham Line CRP Dementia-Friendly Railway Project. 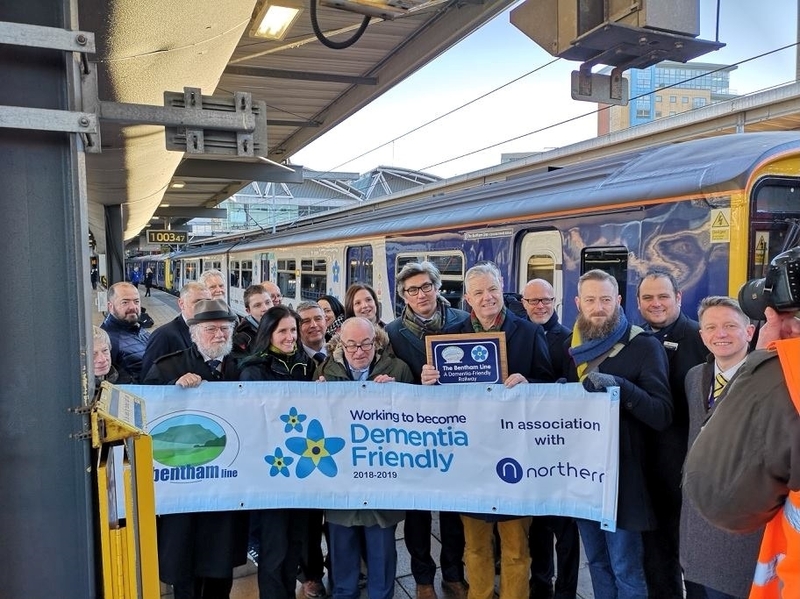 On Wednesday 23rd January at Leeds railway station a train was named “The Bentham Line – A Dementia-Friendly Railway” by Peter Wilkinson, Managing Director of Passenger Services, Rail Group, at the Department for Transport (DfT). Fifty people were present including representatives from the Leeds-Morecambe Community Rail Partnership (LMCRP) responsible for the Bentham Line, the Association of Community Rail Partnerships (ACoRP) and various local charities involved, including Dementia Friendly Keighley, Dementia Friends, the Bay Dementia Hub and Bentham & District Dementia Friendly Community who all provide support for those living with dementia and their carers. Importantly, several individuals living with dementia, who have been involved in the project, were also able to be present along with their supporters. Steve continued; “Thanks to the passionate work that Gerald Townson and his colleagues at the LMCRP have done, supported by Richard Isaac, Community and Sustainability Manager and other colleagues at Northern with additional assistance from: Dementia Forward, Enhance the UK and the Dementia Friends imitative of the Alzheimer’s Society, as well as the DfT; that stigma and fear is being challenged and removed. The activities we take for granted are again becoming enjoyable for people associated with dementia. They can buy their tickets, travel by train through Yorkshire and enjoy a walk on the promenade at Morecambe”. Responding to the warm welcome, the guest of honour, Peter Wilkinson, said; “I am incredibly proud to be at this event. 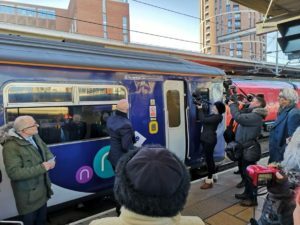 It highlights a significant project that helps make public transport accessible to many more people.” He congratulated both Northern and the LMCRP for the work they had done in raising awareness of dementia amongst their staff, the travelling public and in communities along the line from Leeds to Morecambe. He felt it had the potential to be a world-leading project that could be a beacon to railways in other areas. He added; “Work such as this should spur others on to open up public transport to be truly inclusive to those with hidden disabilities, such as dementia. Public transport is a means of joining communities together”. As more people consider using public transport, in the light of environmental considerations, it is vital that all are able to benefit from such a service. Gerald Townson, Chair of the Bentham Line’s Community Rail Partnership, added his own welcome and thanked all who had contributed to the project, especially the members of the Dementia and Community Rail Project Team. He also expressed his gratitude to Northern for their understanding and support for the project over the past two years, adding a particular ‘thank you’ to their East Area team who had brought to fruition this special train naming. The train, a newly re-furbished Class 150 unit (150214), is one which can travel over all the wide-ranging Northern network so could be seen as far away as Carlisle, Newcastle, Lincoln, Nottingham, Chester, right across West Yorkshire, around Manchester and from the West Coast to the East coast. 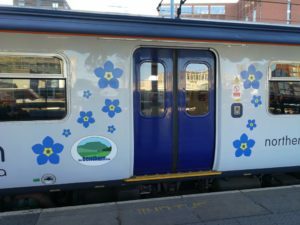 The train will act as an ‘ambassador’ for the work of the Dementia and Community Rail project team over much of northern England. 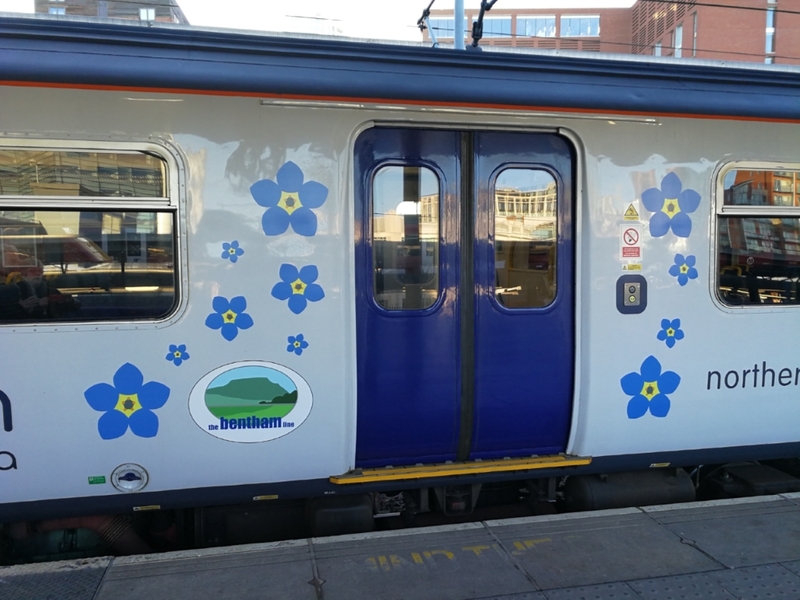 It is the first time that this specific thoughtful design has been applied to a train using the “forget-me-not” symbol as used by the Bentham Line. The symbol is appropriate as while an individual living with dementia may forget they are not forgotten by others who assist them and enable them to live as full a life as possible. As well as the additional external display there are there are posters inside the train and dementia-friendly signage for the priority seating and the toilet. After the name had been ceremonially revealed and photographs taken the group stepped aboard for a trip to Bentham, to look at how those living with dementia can contribute positively to their local community through public art projects. Art work at Bentham Station. Since summer 2018 the CRP has been working with the ‘Making Art’ group at Pioneer Projects in Bentham, a local art and health charity. The ‘Window on Bowland and The Dales’ project has given the opportunity for local residents who are living with dementia to capture their surroundings artistically each supported by a local volunteer and led by a professional artist to meet in a safe, calm and supportive environment. A new laser-cut artwork was been commissioned for the station building and was created by professional artist, Alastair Nicholson, from the drawings, paintings and poetry developed by the members of the Making Art group. It is based on the LMCRP logo and the spectacular scenery surrounding the line. This specially commissioned image was unveiled at Bentham Station at noon on 23rd January by Peter Wilkinson and Carolyn Watson, Community and Sustainability Director at Northern. The art project was an example of something that allowed groups to develop their own initiatives to bring about a positive change to support people with hidden disabilities thus leading to greater inclusivity and also a caring rail community. The concept of the Community Rail and Dementia Project started within the communities along the route. Northern have been very receptive to the project ideas and backed it with generous seed-corn funding. The keenness of the LMCRP to deliver the project has generated considerable support and enthusiasm within the company and also at the DfT. As a further example of their support, Northern have recorded their own videos for their staff to alert them to the needs of those living with dementia. 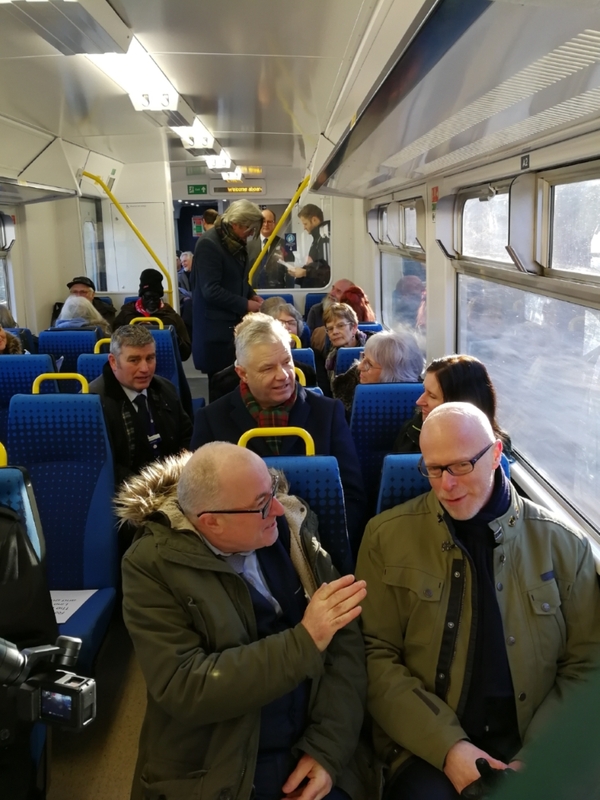 This project is also benefitting from the positive support of the Alzheimer’s Society, Alzheimer’s Research UK and the Association of Community Rail Partnerships, as well as many local groups along the line.